This groundbreaking biography of a brilliant but disturbed performer explores the paradox of the man and the artist. 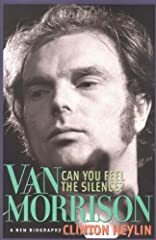 Based on more than 100 interviews, this intelligent profile explores Morrison's roots; the hard times he went through in London, New York, and Boston; the making of his seminal albums such as Moondance and Astral Weeks; and the disastrous business arrangements that left Morrison hungry and penniless while his songs were topping the charts. Detailed are the breakdown of Morrison's marriage, the creative drought that followed, and his triumphant reemergence. In addition, this biography attempts to explain the forbidding aspects of Morrison's persona, such as paranoia, hard drinking, misanthropy, as well as why, in the words of his onetime singing partner Linda Gail Lewis, Morrison's music "brings happiness to other people, not him." Also included is a Van Morrision sessionography that spans 1964 to 2001. About Clinton Heylin (Author) : Clinton Heylin is a published author. Published credits of Clinton Heylin include Can You Feel the Silence? : Van Morrison: A New Biography.